Accommodation near Aitutaki airport has been built by Martha and Neil Mitchell as a SCUBA diver's lodge. Other accommodation near the Aitutaki airport includes the Aitutaki Lagoon Resort on motu Akitua. The most luxurious accommodation, near where I lived for many years and not far from Black Rock Beach, is 5 star beachfront Pacific Resort Hotel in Amuri Village on the north west coast of Aitutaki. Perfectly sheltered from the SE trade winds in the tourist season. I've stayed at inexpensive, comfortable holiday accommodation at an island style beachfront guest house, in Amuri village near the Aitutaki airport. The Aitutaki airport runway is sealed meaning charter flights can land but unfortunately the Aitutaki airport design won't permit Air New Zealand's Pacific work horse jets to take off fully loaded. Because Aitutaki is a small island, all accommodation on Aitutaki is less than 15minutes walk to the lagoon. Des and Tutai Clarke have accommodation near Tautu and also accommodation right on the lagoon beach of Akiami islet. There is also over the waterfront accommodation on the lagoon at Akitua islet and also near The Aitutaki Lagoon Resort and Spa. 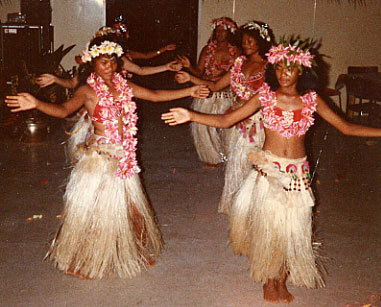 Many resort hotels have Polynesian cultural dancing island night performances. Tourists accommodated at these resorts are invited to dance with Aitutakian hula dancers after their resort hotel dinner. Camping is not permitted on Aitutaki Islets (motus) except by islet owning locals. or the accommodation search box below which list most holiday rental properties / hotels on Aitutaki. At right: Photo of accommodating hula dancers invite Rapae Hotel guests to dance after dinner. A friend of mine, Dave Falkner has interests in the Pacific Resort accommodation on Aitutaki. If you want accommodation near where most Aitutakians live then look for accommodation near Arutanga where most of the shops are. If you want to disappear like a hermit then limited accommodation at the Clarke's place on Akiami islet, on Aitutaki's eastern barrier reef is recommended. It's where the flying boats used to land. On my next trip to Aitutaki I'll make a point of taking photos of accommodation at Aitutaki and familiarising myself with new accommodation built there since my last visit in the late 1990's. Look for accommodation near the villages of Vaipai and Tautu if you want accommodation near more traditional way of living Polynesians. My son Tai Grummels lives in the village of Vaipae. 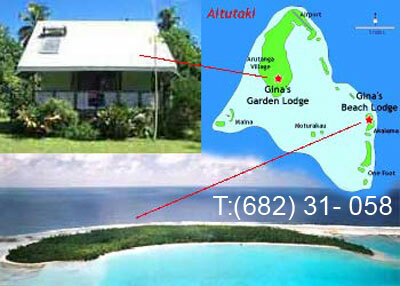 Phone him in Aitutaki daylight time if you want up-to-date Aitutaki accommodation information. My photos of Aitutaki accommodation are old. Photos of Aitutaki accommodation are invited on this accommodation webpage. Contact Ben Grummels or Tai (with $200 pa) to include your big, >1999 pixels wide, photos of accommodation near the Aitutaki lagoon. Accommodation Rarotonga, air travel hub, transit airport to Aitutaki. Capital of the Cook Islands. Accommodation Near Worlds Best Beach Holidays. See the Aitutaki page there. Hotel Marketing We're Google first for hotel marketing Australia, Malaysia, Thailand, Bali etc.